The goalkeepers are the only players allowed to touch the ball with their hands or arms while it is in play and only in their penalty area. 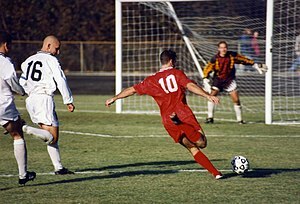 Other players mainly use their feet to strike or pass the ball, but may also use their head or torso. The team that scores the most goals by the end of the match wins. If the score is level at the end of the game, either a draw is declared or the game goes into extra time or a penalty shootout depending on the format of the competition. The Laws of the Game were originally codified in England by The Football Association in 1863. Association football is governed internationally by the International Federation of Association Football (FIFA; French: FÃ©dÃ©ration Internationale de Football Association), which organises World Cups for both men and women every four years. The rules of association football were codified in England by the Football Association in 1863 and the name association football was coined to distinguish the game from the other forms of football played at the time, specifically rugby football. The first written "reference to the inflated ball used in the game" was in the mid-14th century: "Ãže heued fro Ã¾e body went, Als it were a foteballe". The Online Etymology Dictionary states that the word "soccer" was "split off in 1863". According to Partha Mazumdar, the term soccer originated in England, first appearing in the 1880s as an Oxford "-er" abbreviation of the word "association".